Ah, man that hits the spot. Nothing like a great cup of black coffee. In the concluding shots of David Lynch’s 1986 film Blue Velvet, a robin perches on a windowsill. The motif of the robin is repeated throughout the film and its visit marks the end of the surreal and nightmarish events experienced by those small town characters. The image of a bird set against a suburban landscape was revisited four years later by Lynch, this time in the opening shot of the title sequence for his celebrated cult series Twin Peaks, co-created by Mark Frost. Cross-dissolving shots of a Bewick’s Wren and the Snoqualmie Falls placidly introduce us to the fictional Pacific Northwestern town of Twin Peaks, population: 51,201. Lynch and Frost originally intended for the sign to read 5,201, to represent an authentic American small town. However, the show’s network, the American Broadcasting Network (ABC), was wary of producing a show that featured a small, rural town, fearing that the urban demographic wouldn’t identify with it. They forced the producers to change the sign, but despite their fears, Twin Peaks achieved remarkable commercial and critical success during its first season run. Amongst the non-linear narrative plot, surreal themes, and other appreciated concepts, many critics and fans associate the show’s success with the portrayal of small town characteristics, which was uncommon at the time. Now, of course, it's widely regarded as a trailblazer in the television series medium, paving the way for future shows such as The X-Files, Carnivale, Lost, True Blood, and many others. I can remember watching the first day of dailies and thinking, ‘This is going to work.’ There was just something about it. It had a sense of gravity that was very real. Even the credit sequence. [Lynch] and Angelo [Badalamenti] had written the theme. We’d shot a bunch of second unit stuff for the credit sequence and laying it against that music, your jaw dropped. Lynch’s seminal surrealist debut, Eraserhead (1977), was a watershed moment in American cinema. Declared by the filmmaker himself as his “most spiritual film,” it puzzled critics and viewers for its focused attention to abstract images and sounds. Subsequently, semiotics has often come into play when analyzing David Lynch’s films, especially within his more esoteric works like Eraserhead, Blue Velvet, and Mulholland Drive. Twin Peaks is no exception. On the surface the images in the title sequence are defined in their space and subtext quite literally, but in closer detail they reveal the key to understanding this fictional world. *Distichs - A couplet or unit of two lines of verse, usually a self-contained statement. The Wren (the Oak King) is the king of the Waning Year. He rules on from Winter’s solstice (or Yule) to midsummer, killing off the Robin (the Holly King) and king of the Waxing year in the process. On Summer’s solstice, the Robin kills off the Wren and begins its rule. The cycle repeats itself with each season. In Blue Velvet, the robin is introduced towards the end of the film, in the warmth of summer. In Twin Peaks, the wren is the first image in the title sequence and a few images later, we see that the sequence is set in winter as there is snow on the cliffs of the Snoqualmie Falls. Perhaps the two works weren’t meant to coincide, but Lynch’s cyclical use of seasons and themes figuratively connects the two worlds. The credits begin at the crescendo of Angelo Badalamenti’s ethereal New Age score, outlined in neon green with their insides an earthy brown, the letters a nice accompaniment to the rustic industrial machinery and pine trees that dominate the sequence. I met Angelo Badalamenti on Blue Velvet and since then he has composed music for all my films. He’s like my brother. The way we work is: I like to sit next to him on the piano bench. I talk and Angelo plays. He plays my words. But sometimes he doesn’t understand my words, so he plays very badly. Then I say, “No, no, no, no, Angelo.” And I change my words a little bit, and he plays differently. And then I say, “No, no, no, no, Angelo,” and I change my words. And somehow through this process he will catch something, and I’ll say, “That’s it!” And then he starts going with his magic, down that correct path. It’s so much fun. If Angelo lived next door to me, I’d like to do this every day. But he lives in New Jersey and I live in Los Angeles. And while the slow transitions and sleepy imagery impart a sense of tranquility, the overall mood of the sequence implies something sinister or somehow unnatural. 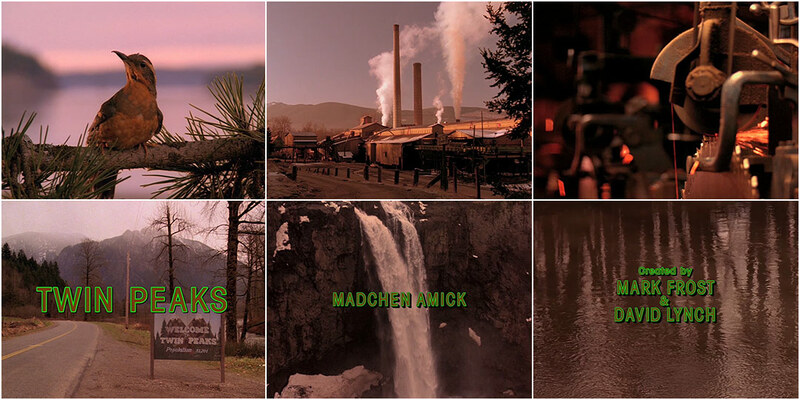 Lynch uses the title sequence to explore something he’s repeatedly explored: the potential for deception within the warmth of small town America. After all, the show is centered on the discovery that one of its most beloved citizens, the high school Homecoming Queen Laura Palmer, has been brutally murdered. The docile town introduced in the title sequence is now forced to investigate itself in order to unravel a murder mystery. Lynch and Frost knew the importance of emphasizing mood and tonality. It’s why the Twin Peaks pilot employs a two-and-a-half-minute title sequence that unabashedly allows the images time to luxuriate. This was subsequently shortened however to a minute and a half for later episodes. The combination of small town serenity with the eerily empathic score creates a sense of comfort while simultaneously hinting at the underlying truth about the setting. 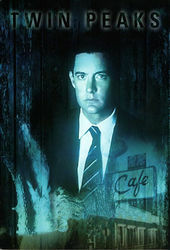 Notably, the town’s residents are absent from the sequence, underscoring the fact that the most important character in the series is the town of Twin Peaks itself.